Shipping Instructions: Blackmon Auctions does not ship or arrange shipping for Buyers. Buyers are 110% responsible for removal and shipping their items from auction yard. Removal of Items: Pay as directed above. When sending your staff or trucking company SEND the INVOICE we send you listing your name and each item that we email you. Otherwise your items will not be released. Also give your trucker the above address and directions! Please remove all items within one week of the auction. Please plan accordingly. Watch for the email with your invoice details! Load-out fees will be added to any item that needs a forklift or crane to move. Preview Date & Times: All items can be inspected early during regular business hours - Monday-Friday from 8am to 5pm. For more information please contact us. To all Bidders - Start time, Catalog, Terms & Condition are only for online bidding. 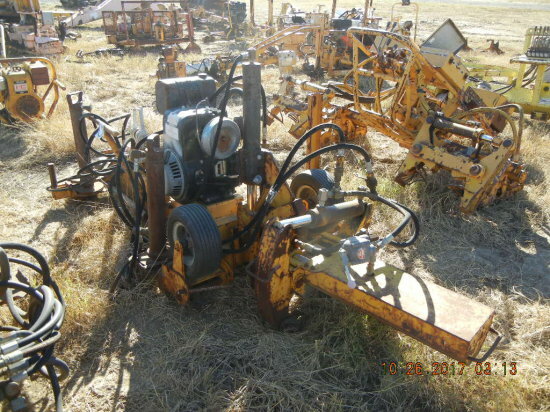 If bidding onsite please visit www.blackmonauctions.com for onsite start time, catalog and terms and conditions. HOW YOU REGISTER IS EXACTLY HOW ALL INVOICES, TITLES, AND RELATED PAPERWORK WILL READ. WE DO NOT CHANGE NAMES, ADDRESSES, OR TAX STATUS ONCE YOU HAVE REGISTERED. NO EXCEPTIONS!!! All (NEW & OLD) Bidders must provide a Letter from their Bank to be approved for Auction. Unless approved by Thomas Blackmon. To be approved without a letter of credit you must email Thomas with your full name & Company name, Blackmon bidder number ( NOT Proxibid Bidder number ) and the last time you have purchased items from us. Buyer's Premium: 14% Buyers Fee with Load-out Fees which will be posted on each item Summary: If you bid and win you must pay – And quickly – within 24 hours of the auction. We have requirements to be met before you can bid. ALL items have been made available for inspection. These items sell like in all auctions since auctions began – AS IS. Send your INVOICE when you send your truck in and remove items as soon as you can! Thanks and read on… Buyers Premium: 14% Buyers Fee with Load-out Fees which will be posted on each item Payment: Payment needs to be made by bank wire transfer the day of the auction or the day after the auction. We will email the invoice and wiring instructions after the auction to THE email address you gave us with in your Proxibid Account. WATCH your Junk Box/Spam Box because we attach the invoice! To be approved to bid: To all Bidders - We do not consider the time or amount of items bought though Proxibid for approval. We have our own rules and terms for approval. If you are a current and established customer with Blackmon Auctions, register and send a quick email to doug@blackmonauctions.com and billy@blackmonauctions.com. Include your Blackmon Buyer Number and/or the name you buy under. If not an established Blackmon buyer we will need much of the following: - A letter from your bank and banking & banker contact information - Your Business Address - Your Web Site - Business Reference - An indication of (Item(s)/Dollar Amount) what you plan on bidding on in this auction - Acknowledgment from you that you understand the terms and you will pay for those purchases the day of or the day after the auction via wire transfer and remove those purchases within one week of the auction. Auction Location: 425 Blakmon Road Lonoke, AR Inspection & As/Is Auction: Inspection of items prior to bidding is available. All items are available to inspect prior to the auction. Many customers have driven and flown in and inspected prior to this auction. Blackmon has described the items simply as a guide. Bidding on items via online without personally inspecting them is a convenience/service provided however it is not a perfect science. Feel free to contact us for more information but know that once you bid on an item it is your responsibility to pay for that item. If you presume more than is described or there are errors in the description(s) you still own those items and are required to pay for them. This is why we make all items available for inspection before the auction. Removal of Items: Pay as directed above. When sending your staff or trucking company SEND the INVOICE we send you listing your name and each item that we email you. Otherwise your items will not be released. Also give your trucker the above address and directions! Please remove all items within one week of the auction. There is loading docks at this facility with loaders that can help on most items – Please plan accordingly. Watch for the email with your invoice details!